One of the first tips that I got when I started studying plant magic was to get a few staples down pat. I mean, I could always summon a fireball, or conjure a knife, but putting dinner together? That requires some special trick! Really, it doesn’t need to be quite that hard. This might sound extra lazy, but I am absolutely willing to cheat with my stir fry sauce, using just hoisin, soy, and hot sauce. Not a homemade hoisin, either, just that sweet and spicy stuff they sell at grocery stores. Maybe you have a knack for potions and can whip up something equally satisfying from raw ingredients and sheer force of will. After my first three attempts turned local villagers into purple, puppy-sized elephants, I gave up looking. One of the primary advantages of a stir fry is that it can be done quickly. Chop the 1st set of veggies, then saute those while working chopping the 2nd. Add those, then stir. If you’re willing to plan ahead, get your chopping done in advance. Group chopped veggies into “step one veggies” and “step two veggies” and just dump them in when the time is right! Fresh brown rice is nice, but not required. Leftover or frozen works. Noodles suffice if you’re in a pinch, or use quinoa or millet if you’re feeling adventurous! Consider making this kung pao a cantrip- something tasty, satisfying, and EASY! Sautee cucumber, carrots, garlic, and celery in sesame oil and roughly half of hoisin sauce until carrots start to soften, around 5-7 minutes. Add water chestnuts (and any alternate veg) as well as remaining hoisin sauce, Braggs/soy sauce, Sriracha, and pepper. This is a saucy dish, so there should be some excess liquid! Cook for another 5-7 minutes until everything is well coated in sauce, and the sauce starts to bubble. Adjust if things like cabbage or brussels sprouts require some extra time to cook all the way through! Add peanuts, mix well to coat. Cook an additional minute, then serve over rice! 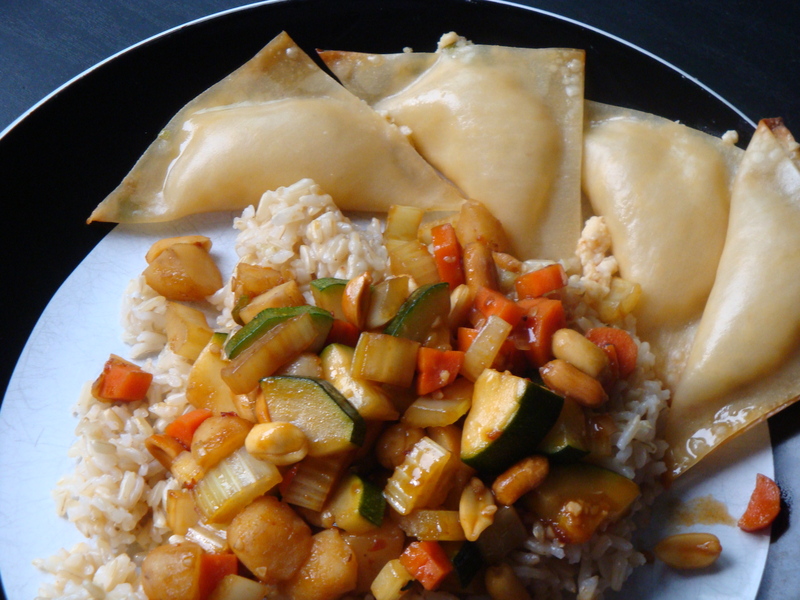 This entry was posted in quick dinner and tagged clean up, easy, rice, spicy, stir fry, vegan. Bookmark the permalink. I like the idea of cutting veggies in groups to saute. Seems the biggest drawback of stir fry is cutting up all those darn vegetables. Sounds like too much time. And not feeling like I have to have 70 ingredients… well, yay. Definitely making this one. Sounds and looks yummy! Sounds really great! I am always looking forward to new ideas for dinner. I am going to try my always ready frozen vegetables in addition to some chopped to add variety and ease. Trying to be added to your email subscription list…no luck..Please add me. The widget was just added- check for “Join our Frequent Casters” on the right hand side of the page! (it might require refreshing the page!) And thanks for stopping by!